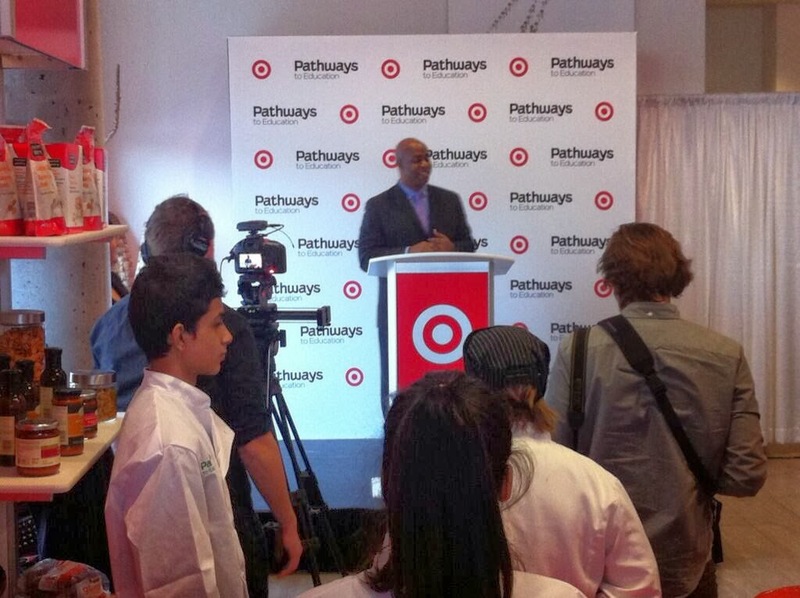 This afternoon, at an event held in the heart of Toronto's Regent Park, Target Canada Senior Vice President of External Relations Derek Jenkins announced that they will be contributing $250,000 to support the Pathways to Education program. scholarship funding to support transition to college or university. It was only fitting that the event take place in the Regent Park Community where Pathways first began. Since then, the program has installed sites in 13 communities across Canada. As Pathways President and CEO Vivian Prokop announced in her opening remarks, the results from the Pathways program have been outstanding. Thanks to Pathways' efforts and through the support of Target Canada and the Ontario government, there has been a reduction in dropout rates of over 70% as well as an increase in youth attending college or university of 300%! This is Pathways Vision - to create a Graduation Nation by "fueling a movement that levels the playing field so that all youth have an equal shot at a rewarding future." And Target Canada shares that vision. Through their investment of $250,000, Target Canada is helping to fund food and nutrition programs for all Pathways sites across Canada. This includes healthy snacks and/or meals for tutoring and mentoring sessions, as well as nutrition and healthy-eating education support and meals for community celebrations. 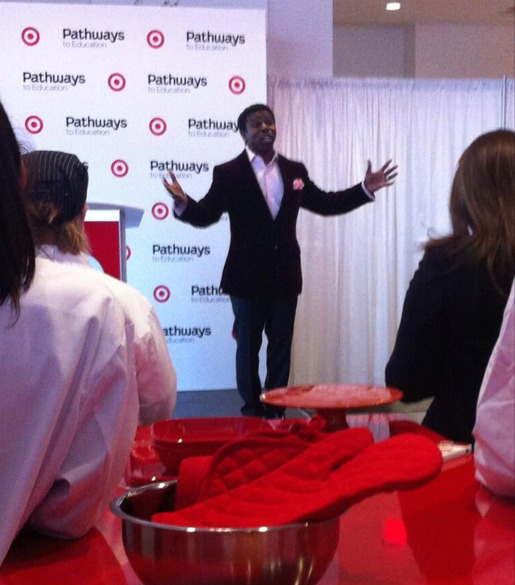 On hand to host the event was the one and only Michael "Pinball" Clemons. During his remarks, he spoke about his own pathway as a youth, one that, contrary to popular belief, was not rooted in football but rather in education. He credited a large part of his success to his mother and her unyielding dedication to keeping him focused on his academic journey. He concluded by affirming the importance of healthy nutrition and the role it plays in developing a healthy mind. In celebration of the exciting news, Target Canada executives and Pathways students teamed up with chefs at cooking stations to create nutritious foods for the attendees. Fellow blogger Kate of Little Miss Kate joined Mr. Jenkins at the turkey meatball station and I teamed up with Raj and a couple of Pathways students at the chicken station. While it was a little nerve-racking at first trying to come up with a recipe and a creative name for our sandwiches, we managed to work together to create garlic aioli chicken sandwiches and butter chicken sandwiches. We had hoped to make two additional international-inspired sandwiches as an ode to the cultural mosaic that is Canada but we ran out of time. All in all, it was a heartwarming (and stomach-filling) event. It was an honour to be a part of it and to be able to work with such wonderful students. May the partnership between Pathways and Target continue to grow and contribute to the bright futures of our youth for years to come. I love that Pinball spoke at the event. He is such a good family man with such dedication to kids! Diana, this is a great overview of yesterday's event! it was a pleasure meeting you and I really appreciate you taking the time to come out and cook with our Pathways students. I particularly enjoyed the butter chicken sandwiches! Hope we may have the opportunity to cross paths again soon, thanks for all your support! What a great cause. Have you got the recipe for butter chicken sandwiches? They sound really good! Pathways to Education is a great organization, and what a difference it has made in the lives of many young people. What an inspiring program! Glad that Target supports this!